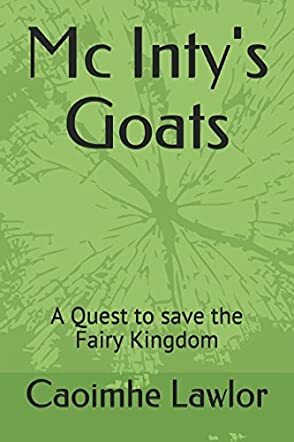 Mc Inty’s Goats: A Quest to Save the Fairy Kingdom by Caoimhe Lawlor is the story of a young leprechaun who was a thousand years old and lived inside the hollow in a Great Elm Tree. He had lots of friends in the forest and because the Great Elm Tree was a cozy place, he received a lot of visitors too. His friend, Nettle, had bid him farewell and before leaving she had advised him to leave the Great Elm because Mc Inty and his fairy people were in serious trouble. Nettle had also warned Mc Inty about Sleath, who intended to find and plunder the fairy kingdom. He decided to visit Dandelion, a fairy princess who lived with all her kind in the small foothills before the great mountains. Will he be able to help defend the fairy kingdom with the help of fairies, leprechauns, and his other friends? The story is filled with whimsy, magic, and adventure, and the leprechauns, fairies, goats, mushrooms, trolls, Sleath, Banshee, Mother Earth, Clodagh and his horse Moonshadow, and all the other characters add to the fantasy of the story and make it enthralling to young readers. The details are descriptive and they bring the scenes and characters alive and make them vivid to readers. The plot, characters, and the whimsicality make the story reminiscent of Enid Blyton tales in which readers are introduced to magical characters and places as in this story. This book is definitely a must-read for all children who love fantasy and adventure as it will evoke their imagination and creativity.